Causing to defraud another person related to a commodity transacted for a future delivery. It may include any form of a security that is included in the classification provided by the Securities and Exchange Act. The commission of misrepresentation, false statements, or false promises to obtain anything of value, such as money and property, in relation to a sale or purchase of a commodity. Failure to disclose material facts related to the exchange of securities and provide false statements instead. The Federal Bureau of Investigation (FBI) may investigate the crime of securities fraud and crimes related to manipulating the financial market and defrauding the investors. The office of the United States Attorney under the Department of Justice may also find meritorious cases to investigate the crime of securities fraud under 18 USC § 1348 in relation to insider trading and pursue the prosecution for the commission of the offense. 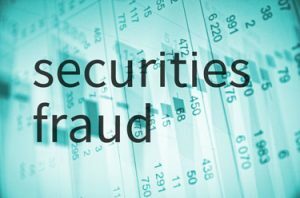 The penalties for securities fraud may vary with different sanctions according to the nature of the acts or omission constituting the offense under 18 USC § 1348. Anyone who certifies the report required knowing it to be false shall be liable to a fine not more than $5 million or imprisonment of not more than 20 years or both. New Haven, Connecticut – On April 13, 2017 – U.S. District Judge Jeffrey A. Meyer of the District of Connecticut sentenced COREY BRINSON, 37, to 36 months imprisonment and 3 years of supervised release and was also ordered to pay $1,417,810 in restitution for the crime of SECURITIES FRAUD, in violation of Title 18, United States Code, Section 1348. As part of the scheme, BRINSON, who did not have any experience with securities and securities markets, would participate with his co-conspirators to sell (DUMP) their own shares at a profit, causing the price of the securities to fall, leaving investors with worthless and unsalable stock. As a result, victim investors lost millions of dollars. With a 36 months sentence, Brinson by law could receive 5 months and 3 days of good-time. With “Good Conduct Time, Brinson” should serve a total sentence is 30 months and 27 days in custody. Had Brinson retained Wall Street we could have gotten him qualified for a 9 month early release as well as an additional 6 months of Halfway House/Home Confinement. This would result in him serving as little as 16 months in a Federal Prison setting! Long-term prison sentence can sometimes be avoided in white collar crimes, such as a securities fraud pursuant to 18 USC 1348. Wall Street Prison Consultants specializes in helping federal and state offenders to obtain sentence reductions through programs that can help provide alternative solutions to long term incarceration. Our consultation services employ investigative and research processes to assist inmates and their lawyers in finding the best solution and alternatives available to reduce prison terms of an inmate. Discuss possible solutions to your issues today.